Following on from the emotional portraits I took at a friends hen party, I printed the photos out in black and white and had them ready at the wedding. During the reception I asked each of the hens to destroy the photos by writing over them, draw on them or even colouring them in. These are the final results. I think they are great and more importantly, so does the bride! This morning I was asked to take some photos of children in the Kid’s Church at Scunthorpe Baptist Church. I took the opportunity to take some character portraits that I will hand-in to be marked but as I do not have permission to post them on the Internet, I cannot post them on here. I didn’t have long to take the photos or have room to set up any lights. Instead I stood them in front of a white cupboard door that was at right angles to a large window. I then opened the cupboard door next to them to reflect light from the window on the opposite side of their face. I was asked to create some passport style photos that could be stuck onto an ID card so those and the character shots that I did at the same time are presented on a contact sheet as square photographs. Tina, by JH Lynch is a familiar painting to many people who were around in the 1960s and 70s. If there was not one of these reproductions in your own home, then there was probably one in the home of someone you knew. Originally bought, complete with cream plastic frame, from Boots or Woolworths, copies can now be found in junk shops and car boot sales. Despite the fact that copies of his paintings sold in their thousands, very little is known about Joseph Henry Lynch. We do know that he was born in Britain, he died in 1989 and, frustrated with his lack of recognition he gave away, donated many of his paintings to charity or destroyed them before he passed away. Those that are left are apparently in the possession of his nephew. 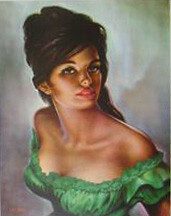 Although he did paint some urban scenes and a portrait of Winston Churchill, many of Lynch’s paintings are of beautiful, sultry Spanish women in front of simple backdrops. Tina is probably the most familiar of his paintings but Tina (Green Dress) is much rarer and therefore more valuable. Interestingly the position of Tina’s head is almost identical in the two paintings suggesting that he painted one and used that as a basis for creating the other. It has been suggested that Lynch was inspired to create some of these paintings after seeing photographs of well known actresses like Jean Shrimpton, so I thought it would be fun to recreate one of Lynch’s paintings as a photograph. I initially considered Tina but when I couldn’t work out how I might get a tree trunk (or even a log) into the studio I thought again and chose Tina (Green Dress). I arranged for a model to come to the studio and found a green gypsy top for her to wear. I also found a nice blue and yellow backdrop that I could use. To reduce the amount of work I needed to do in post production I arranged for her hair and make-up to be done. I set the studio up using three lights, two to evenly light the background at f5.6 and one to the left of the image at a 45 degree angle to the model at f8. All of the lamps had softboxes on them to give a nice soft light. The light in the painting is very soft so, after a few test shots with the flash, I chose not to use the flash and simply to use the modelling lights with a reflector to reflect some light back onto the model. To ensure that I was slightly above the model so that she could look up to the camera I asked her to kneel on the floor before directing her into the position that I wanted. I had my camera on a tripod set at f4.5, shutter speed of 1/10 sec, ISO 100 and a focal length of 35mm. It meant that the model had to be quite still but I liked the effect I was getting. In post production I cropped the image from landscape to portrait and used the clone tool to disguise some skin blemishes. I increased the blue saturation and decreased the red saturation to cool down the skin tones. Then I used the adjustment brush to darken some areas across the chest. This is the final image. I am quite pleased with the final result, I think I have managed to reproduce the lighting and the general scene quite well but am disappointed that I haven’t positioned my model’s head at the correct angle. I think that if I did this again I would try to quickly view the image on a larger screen, that way I would be better able to see the picture that I was making and compare it to the original. For my self-portrait assignment, once I had stopped sulking about having to take photographs of myself, I took inspiration from David Hockney’s, cubist inspired, photograph of his mother. I think I need more practice in the studio so that is where I wanted to take the self-portrait. I set four lights up, two to light up a white background and another two to light my face and shoulders. I didn’t want the photos to be restricted by a tripod so I left that behind and asked a friend to hand hold my camera that had my 18-200mm lens attached. I had already set it to 100ISO, F8 and 125sec. I sat in position and directed my friend to take photographs of my whole head and shoulders and then individual features. She was kind enough to oblige and only take photos as I directed. When we had finished I downloaded the photos into Lightroom, resisted the urge to edit out all of the features I don’t like and used the ‘Open as layers in Photoshop’ function. Then I turned off all of the layers in order to turn them back on again in turn, resizing, repositioning and re-ordering the layers as I wanted. This is my final image. I also took inspiration from Indris Kahn and the typology work we have been doing and edited my self-portrait together in that style too. Again I used the ‘Open as layers in Photoshop’ function but this time chose one image as my background and turned all the other layers off. I then turned on one layer, resized and lined it up before turning it off and turning on the next layer. I did this for all layers, doing my best to line each one up with the background image, particularly around one of the eyes. When I was satisfied that all the layers were lined up as I wanted, I adjusted the opacity of each layer so that layers at the top of the pile were more opaque than those at the bottom. This is my final image and my preferred self-portrait. I have to say that I don’t think either of the images are particularly flattering but they do emphasise the idea that I am a complicated human being with many many sides to me. I think the second version suits me better as it is a lot softer and I am an old softy really. As far as exploring my character, I think these illustrate how serious I am a lot of the time and how seriously I take photography. Although maybe I also struggle to smile and think about taking photos at the same time! For my first character portrait I invited Sarah Follon, a freelance theatre stage manager to come into the studio between performances. Being a stage manager, she almost always wears black so I wanted to take images against a black background but as she is also a lot of fun, I didn’t want to lose her into the background and make the image too ‘moody’. I set up four studio lights, a key light and a fill light, set at 45 degrees to the front of the subject and two strip lights set at 45 degrees behind the subject. We were fairly close so I set the key light and the camera to f8. The two strip lights at the back were set slightly higher in order to give a bright highlight around Sarah’s shoulders and separate her from the background. Sarah’s job means that she is hidden during a performance and I wanted to put her in the spotlight. At first I sat Sarah on a chair where she sat quite stiffly and properly, posing for her portrait. I asked Sarah to kneel behind and lean on a box that was in the studio, than I asked her about her work at various theatres and the show Bouncers that she is currently working on. She relaxed a lot more and began to get much more expressive with her hands especially when she was telling me about a play she had seen recently where the curtain had got stuck and looked like it was going to fall down part way through the performance! I gave Sarah some direction in terms of poses to try but mostly I tried to make it more of an chat between friends and keep her so distracted in what we were talking about that she would take less notice of the flashing lights. Sarah laughed a lot throughout the shoot and I think I captured this fun aspect of her character quite well. These though are my favourite images.